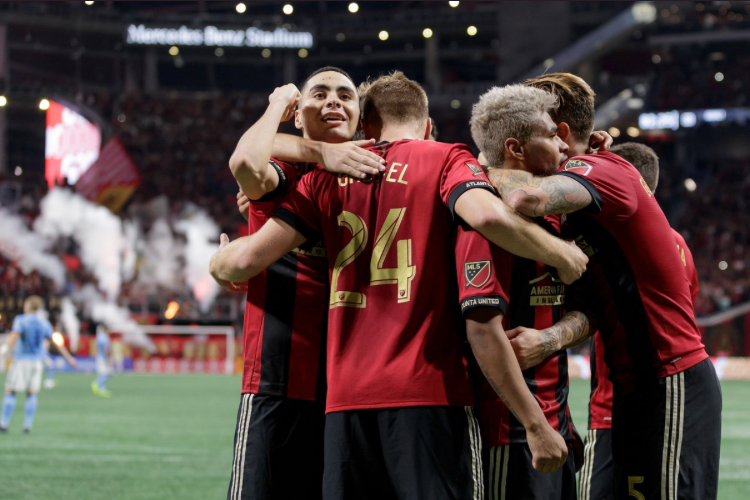 Atlanta dominated from the start on Sunday, and they took advantage in the 25th minute when they were awarded a penalty kick. Josef Martinez took it and buried it to give the home team a 1-0 lead. It didn't take long for them to double their advantage. In the 42nd minute, Miguel Almiron launched a rocket from the top of the box by NYCFC goalkeeper Sean Johnson to make it 2-0 on the day and 3-0 on aggregate. NYCFC would need four goals to advance, and Maxime Chanot gave them a glimmer of hope before halftime as he scored in the 45th minute. That hope would be short-lived, as NYCFC never really had a chance in the second half. Martinez got his second goal of the match, with an assist from Eric Remedi, in the 83rd minute to make it 3-1 and seal the game. Atlanta moves on to play the Red Bulls (3-0 winners over Columbus on Sunday night) in the Eastern Conference Finals.